Going house shopping? Use this printable sheet to record your impressions and stay organized. Capture key aspects of a home including condition, your impressions, and major warning signs. For more ideas about home shopping and what to look for see our blog post Things to Look for When Shopping for Home. 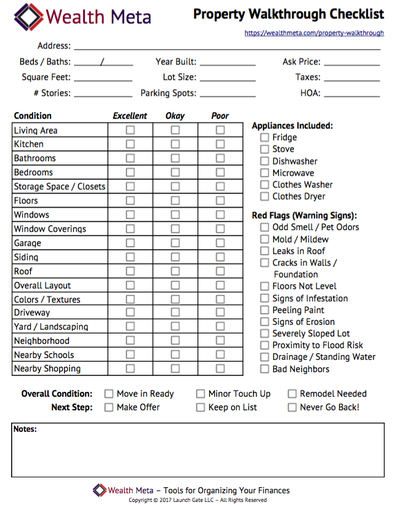 1) For each property you are viewing bring a printout of the Property Walkthrough Checklist. 2) Fill out the property address and general details at the top. 3) As you are looking at the property note the following items as either Excellent, Okay, or Poor. 6) Note the overall condition as either “Move in Ready”, “Needing Minor Touch Up”, or “Remodel Needed”. 8) Jot down any additional notes you have about your experience at the property. If you really like the place and get an accepted offer make sure to schedule an impartial home inspection. None of your own observations should take the place of a professional home inspection!